The Colombo International Shopping Festival, which will be one of the happening events of the year, will start off for the first time in Sri Lanka under the patronage of Hon. Minister of Tourism Development and Christian Religious Affairs, John Amaratunga, from 20-22nd October 2017, atthe SLECC, from 10am to 10pm. This event is organized by TheMinistry of Tourism Development and Christian Religious Affairs in collaborationwith Sri Lanka Tourism Promotion Bureau and SriLankaRetailer’s Association, in order to showcase and create the ultimate shopping experience and to promote Sri Lanka as a shopping destination for tourists. This will be marked as an annual event in the Tourism calendar. “Sri Lanka’s strategic location in the Indian Ocean was well noted by ancient traders who travelled from east to west and vice versa. It formed an integral part of the original maritime silk route. 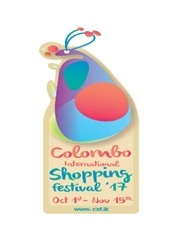 Today we are seeing a revival of these trading traditions with the launch of the Colombo International Shopping Festival spanning the length and breadth of the country,” said Minister of Tourism Development and Christian Religious Affairs, John Amaratunga. “It offers an ideal platform to showcase our produce ranging from spices,handicrafts, jewellery, clothing and food to hi-tech electrical and electronic equipment at very competitive prices. The festival is an added attraction for tourists to visit this beautiful island and benefit from the shopping bargains on offer for global brands,” added Minister Amaratunga. Mr. Esala Weerakoon, secretary to the Ministry of Tourism Development and Christian Religious Affairs, said that this is indeed a significant milestone in tourism development –one great window of opportunity for tourists who are attracted by the beauty and the serenity of our country. ‘’They will now have more to look for and to take back pleasant memories. It is equally beneficial to Sri Lankans here and abroad who can learn of the strides we are making’’ he further added. The festival will bring a new dimension towards the shopping experience in Sri Lanka, allowing the consumers to buy renowned brands at the most cost – effective manner by catering to each need by expanding services related to travel,lodging,payment, and showcasing what Sri Lanka has to offer. Another objective of this event is to promote Sri Lanka as a’’ shopping Hub ‘’ and attracting tourists to have a shopping experience in the typical Sri Lankan style. The event is expected to be the first shopping festival of a large magnitude to ever take place in Sri Lanka, attracting tourists with local and branded products, which will attract largely to the South Asian audience, which will also encourage the local entrepreneurs to showcase their products and get recognition in the global market. Apart from the general products and services, including house hold consumer durables, handicrafts, ceramics, Gem and Jewellery, Tea, value added choir products, local and western cuisine, ayurvedic and healthcare products. Specific tourist segments will also be targeted such sports tourism, adventure tourism, heritage, cultural, religious tourism, eco-tourism and promoting Sri Lanka’s exquisite beaches. A touch of glamour also will be added with a cultural show, where there will be a large number of food stalls to tantalize your taste buds. All are welcome to come and enjoy the variety of stalls and shop to their hearts content at this mega event which will offer everything the ordinary consumer needs under one roof. Mr. Udaya Nanayakkara, Chairman, Sri Lanka Tourism Bureau said, ‘’ shopping festivals of this nature has to be positioned as an annual event. With past experience of such events, conducted in Singapore and Dubai, has become much sought after for mainly regional tourism and to some degree to international tourism in the two countries. Data available clearly indicate repeat custom visitations from the region. Such events are now enhancing the offerings with cultural events, etc. It is encouraging that the major retailers have grouped themselves together as the Retailer’s Association of Sri Lanka to conceptualize this maiden effort, and we’re glad to partner it together with our own brand endorsement.I am positive that all will learn from this first effort and will fine tune it further next year and thereafter making it a grand success in attracting shopping tourism, primarily from the region with possible extension. Finally, it should become branded as Sri Lanka’s annual shopping festival spreading to every corner of our beautiful island". Mr. Hussain Sadique , chairman of the retailers association expressed that it is the first time the Colombo International Shopping Festival is conducted, to attract foreign tourists while their stay in Sri Lanka, for all their life style needs as world class brands and products are available in various retail outlets in Sri Lanka. They will also be able to have the ultimate Sri Lankan shopping experience. He further said through this three-day event, various products will be available at special rates.